Palce of Birth: Recife, Brazil. Date of Birth: April 19, 1972. Corinthians (Brazil) 1993, 1994 = 41 matches and 17 goals. Deportivo La Coruna 1996-1997 = 41 matches, 21 goals. On the final day of last season, Rivaldo scored an epic hat-trick in Barcelona's 3-2 win against Valencia. His last-minute winner was an implausible bicycle-kick reminiscent of Pele's clincher in the film Escape to Victory. O Rei's cinematic decoy helped Sylvester Stallone and co from a prisoner of war camp. 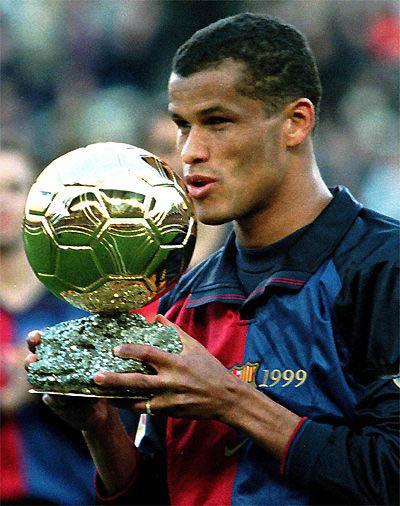 Rivaldo's replica earned Barça an 11th-hour reprieve from the Uefa Cup. Four months later Barcelona's saviour made his 2001-02 home debut against Lyon. Boos and whistles echoed around Camp Nou every time he touched the ball. Forget the fact that Barca would not have been playing Champions League football in the first place if it hadn't been for Rivaldo; it was a mind-boggling response to four years of unwavering brilliance. In Rivaldo's first two seasons at Camp Nou, Barça were Spanish champions. In 1999, he was the FIFA World Player and European Footballer of the Year. No Barça player in the past 25 can match his 125 goals in all competitions. His 31 goals in Europe are a club record. Despite his bow-legged gait, and languid demeanour, Rivaldo is neither fragile or fickle. He has played in 140 of 162 games since his 1997 transfer from Deportivo La Coruna. Tellingly, Barça managed a modest eight victories in the 22 games he missed. The Brazilian\\\'s ability to raise his game on hostile stages is legend. Last season, he became the first ever visitor to score three goals at Milan in European competition. Only a dubious offside call prevented him becoming the first Barça player to score a hat-trick at Real Madrid. So what has Rivaldo done to deserve such shoddy treatment? 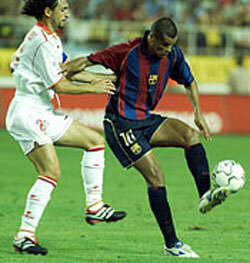 Ten days after Barça league bow at Sevilla, Rivaldo damaged knee ligaments playing for Brazil against Argentina. On his return to Spain, Barcelona's doctors aired the possibility of surgery. Coach Charles Rexach publicly resigned himself to losing his star player for two months. Rivaldo's decision to fly back to Rio for rehab was slated as an unprofessional whim. Yet, miraculously, he was back at Camp Nou within 14 days. Forty-eight hours later, Rexach left him out of Barcelona's match at Real Sociedad citing lack of match fitness. World Cup duty against Chile meant the Brazilian missed Barça's next two games as well. Hence the tardy home debut against Lyon. Needless to say, Rivaldo was the only one of 29 Spain-based players to face a chorus of boo-boys on his return from international duty. But what exactly was his crime? Getting injured? Recovering in record time? Flying 17,000 kilometers to face Real Sociedad only to be snubbed? Talking absolutely no part in the slanging match between Barcelona and Brazil coach Luis Felipe Scolari. Not for the first time Rivaldo was a pawn in political spat. This time it was Barcelona and the Brazilian federation at loggerheads. In the past, former Barça president Josep Nunez consistently undermined his own player as a way of attacking his arch-emeny, Josep Mingeulla (Rivaldo's former agent). In a city that boasts two daily sports paper with myriad hidden agendas, Rivaldo's refusal to curry favour has created powerful enemies. He was accused of using Luis Figo's defection to Real Madrid to secure a handsome new contract from incoming Barça president Joan Gapart. The fact that Nunez even refused to sit down with Minguella and Rivaldo for several months before Figo's move was conveniently ignored. Rivaldo was again chastised by the media during financial wrangling this summer. As it turned out, Barcelona owed him 2 million in back-pay. The Brazilian spent a dirt-poor childhood in Recife doing 15-mile round trips to training on foot. A six-inch scar on his right foot is a reminder of when a wall fell on him en route. Can you blame him if he wants to get paid in full? And nobody barracks Patrick Kluivert or Luis Enrique (two players with the de ringueur media acolytes) for earning silly money. "The Barcelona fans are much too quick to turn against their own players," says former coach Bobby Robson. Especially those who don't spout politically correct platitudes about Barça's status as a Catalan flagship. Hristo Stoichkov, Camp Nou's last great idol, was happy to play the crusader in a nationalistic crusade. Rivaldo, on the other hand, has never pretended to be anything other than a professional footballer, on call for the duration. When Stoichkov isn't playing for the Chicago Fire he calls Barcelona home. Five years after being sacked by Barça, nothing has tempted Johan Cruyff away from his home 10 minutes' drive from Camp Nou. Ronald Koeman has built a house on the city outskirts and makes no secret that his ambition is to coach Barça one day. Yet there is more chance of Osama Bin Ladin buying a condo in Manhattan than Rivaldo settling down in Catalonia when he retires. None of these things should matter. Nor do they in the dressing-room. Rivaldo's team mates were incensed by the latest outbreak of heckling. Rexach swears by "the most decisive player in the world". Barcelona's more perceptive fans worship at his altar, too. "Rivaldo, you're God. Forgive those who whistle you," read a banner at Camp Nou before the Brazilian's two goals against Betis in his second home game. The perpetual frown on Rivaldo's face these days suggests that's easier said than done. Rexach admits that squeezing Rivaldo, Kluivert and Javier Saviola into the same forward line can be a problem. Kluivert, 25, and Saviola, 19, are both under contract until 2006. Rivaldo is 30 and out of contact in June 2003. Long time suitors Lazio and Juventus have made a note of the latest episode of disharmony. Realpolitiks suggest Barcelona will cash in this summer at the latest. * Jeff King, The Barça loner, World Soccer article, December 2001, p. 14. After capturing his first world cup medal with Brazil in World Cup 2002, Rivaldo decided not to return to play for Barcelona when Van Gaal was appointed the coach again. Rivaldo had clashed many times with Van Gaal and decided to leave and signed to play with AC Milan. Unfortunately for Rivaldo, that move turned out to be one of the worst of his career. He lasted only a season and half and was benched alot. 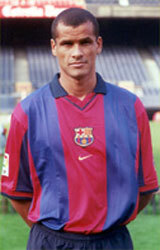 Come the January transfer in January 2004, Rivaldo was allowed to leave. At his time in Milan, Rivaldo could only muster 5 league goals, 1 Copa Italia goal (in the final) and 2 Champions league goals. He did not get to play a single minute in the Champions League final when Milan defeated Juve. After that horrible spell in Milan, Rivaldo decided to go back home and play for Cruzeiro in Brazil. Cruzeiro was coached by former Brazil trainer, Wanderley Luxembergo, who happened to be a close friend of Rivaldo as well. However, once Luxembergo resigned under mysterious circumstances, Rivaldo left the club as well. He is now currently playing in Greece for AEK Athens after three seasons at Olympiacos.